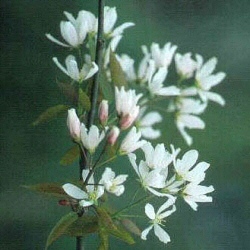 A lovely small spreading tree, the Ballerina Snowy Mespilus tree (Amelanchier x grandifolia 'Ballerina') forms a mass of delightful creamy-white flowers during spring. Small, edible, red fruit form and slowly become dark plum coloured as they ripen. This tree is best planted in a sunny position, where its leaves are bronze coloured and gradually change to dark green. Autumn sees this tree turning vibrant shades of oranges and reds. With a final height of only 5m (16ft 8in), this tree is ideal for a small intimate garden. This tree is supplied at a height of between 1.5 and 2.0m in a 7-12 litre container for year round planting and better results than from bare-root or rootballed stock.